I am CRAZY about these crock pot baked potatoes! They are sooooo... easy! It has been WONDERFUL! I have 2 crock pots, one is a little sad looking but works great- and the other is new. I use both all the time for "complete" meals to be done all at the same time. I use one crock pot for the baked potatoes and another for steak stroganoff, pot roast, lemon pepper garlic pork loin etc. There are MANY wonderful crock pot meals you can have with baked potatoes! This is a GREAT way to make baked potatoes for lots of people. The potatoes are done when you want them to be and everything is ready all at the same time! Isn't that what we all strive for!? Wash and scrub all baked potatoes- dry off with a paper towel. 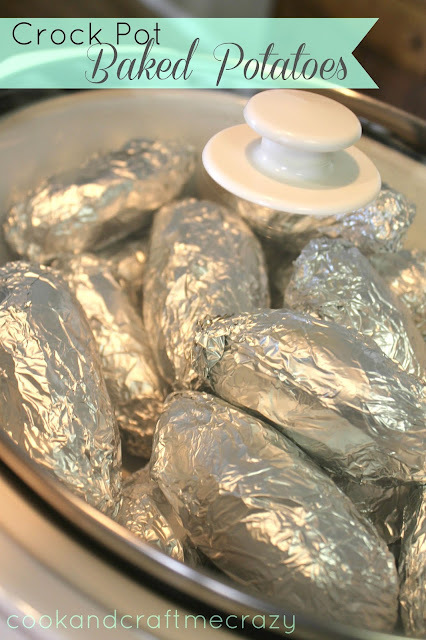 Wrap each baked potato in aluminum foil and place in your crock pot. Cover and cook on Low for 6-7 hours or High for 4-5. *This picture was taken when I was at my parents house and we had 12 people eating dinner with us. THIS WAS PERFECT to have all the potatoes "baked" in the crock pot. They were ready when we were! I love crock pot potatoes! We often times have potluck potato bar at work and this how i have always cooked our potatoes! They are the BEST! I had no idea you could "bake" potatoes in a crock pot! I might just have to try this. When all my kids come home with their families I need all the cooking space I can get--what a great idea. I'm pinning--I will have a houseful next month! I have a scalloped potato recipe on my blog that I cook in the crock pot--it is yummy. Perfect for a crowd. Can't wait to spend more time at your blog--looks fun. I found you on dessert now dinner later! I have seen this & I still need to try it! Thanks for the reminder! Thanks for sharing at Sweet & Savory Saturdays #12! I'm so going to do this I'm always looking to hurry have stuff all ready at once so yes it's what I strive for!